We reviewed our experience of performing laparoscopic sleeve gastrectomy (LSG) in super-superobese (body mass index >60 kg/m2) patients and compared our results with those of laparoscopic adjustable gastric banding (LAGB) performed in similar patients. All LSGs performed by our group were reviewed retrospectively. We analyzed only patients whose preoperative body mass index (BMI) was greater than 60 kg/m2 and compared the results with a report in the literature of super-super-obese patients treated with LAGB. Between October 2000 and November 2005 we performed 63 LSGs for super-super-obese patients whose average preoperative BMI was 68 kg/m2. By 6 months postoperatively, the average BMI had decreased to 58 kg/m2. Forty-three patients subsequently underwent a second-stage duodenal switch procedure within 1 year. The BMI of the 20 patients who did not undergo further surgery decreased further to 50 kg/m2, 1 year after the LSG. 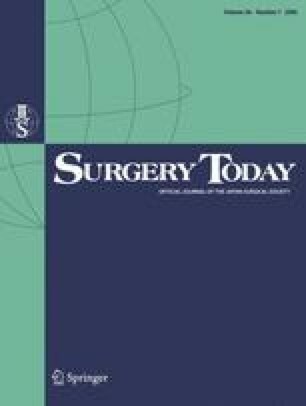 Laparoscopic sleeve gastrectomy is comparable with LAGB for promoting short-term weight-loss in the super-super-obese. The benefits of LSG over LAGB include a decreased need for reoperation; first, because foreign material is not implanted in the body; and second, because the residual ghrelin-producing gastric mass is much smaller.